EL PASO, TX – ScottHulse attorney Melissa A. Baeza recently participated in “Women in Construction Week” by speaking to the El Paso Chapter # 248 of the National Association of Women in Construction (NAWIC). 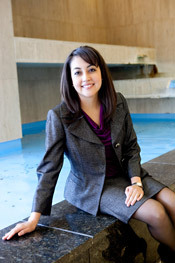 Ms. Baeza, a construction law and commercial litigation attorney, addressed the topics of construction contract clauses, liens, and bond claims at the local event held during “Women in Construction Week,” which was observed nationally and also acknowledged locally in a proclamation by Mayor Oscar Leeser and the City of El Paso. Ms. Baeza, a member of the NAWIC, advises and represents owners, general contractors, subcontractors, engineers, and other construction-related professionals in all phases of public and private construction. Ms. Baeza handles various types of commercial disputes, including professional negligence, breach of fiduciary duty claims, violations of the Texas Deceptive Trade Practices Act, breach of contract claims, and fraud claims.